27. The next material to concentrate on is the metallic table legs. 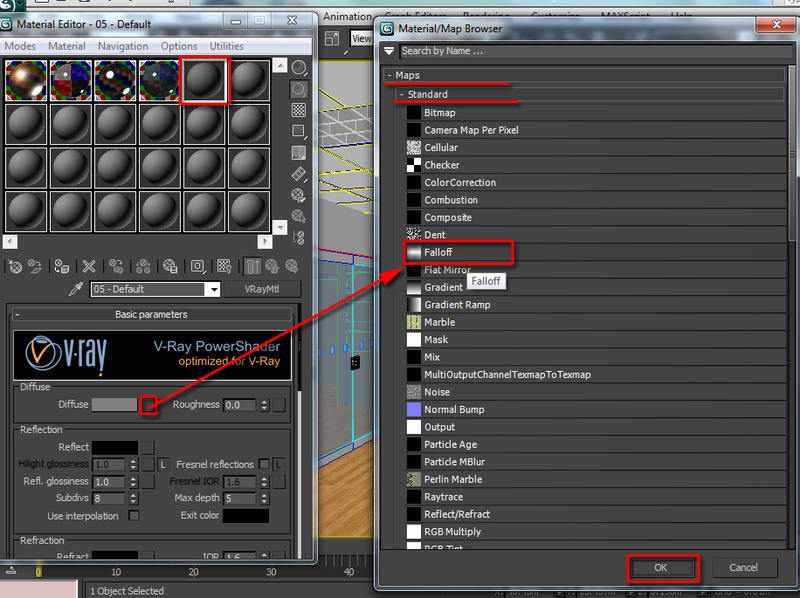 A- Create a new v-ray material slot in the material editor and name it “metal”. 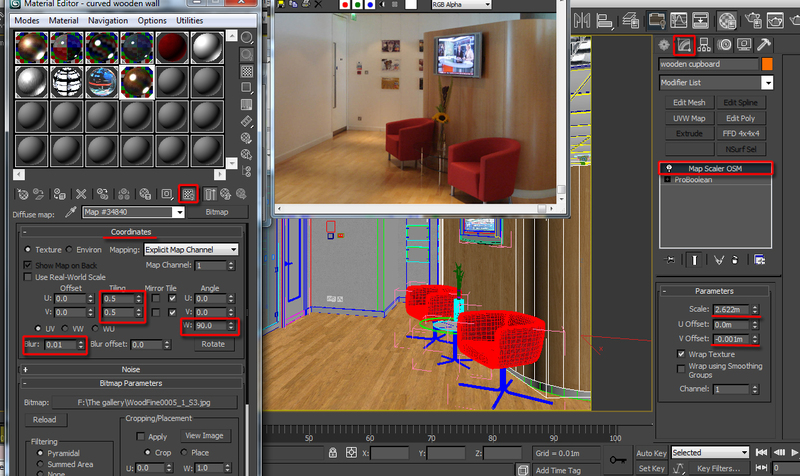 B- In the scene, select the object under the name of “legs”, and isolate it. 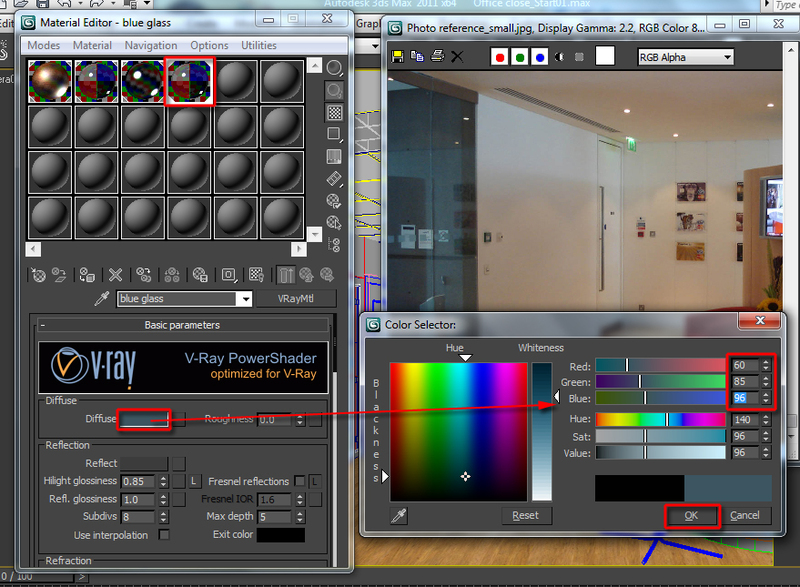 C- In the material editor, change the diffuse color swatch to a really dark grey tone(R=2.0; G=2.0; B=2.0). This is the color value mostly use for metallic materials. D- In the “reflection” group, change the “reflect” color swatch to light grey( R=126; G=126; B=126) to add some reflectivity to its surface. E- Also, to add some shine to the surface, decrease the “highlight glossiness” value to about 0.75, and the “refl. Glossiness” to about 0.8. One can try different values if desired. Assign this material to all the relevant metallic objects in the scene. Alternatively, you may want to create many variations of the same material (different diffuse colors) for different metallic objects. 28. The table leg looks slightly grainy. While metallic surfaces require a fair amount of graininess, it currently looks excessively grainy. Increase the reflection subdivision to about 20.0 to eliminate some of the excessive grain. Increasing this value will increase the rendering time of this material slightly. However it will yield results similar to the photo reference. You may also apply the “vrayedgetext” procedural map, if desired. 29 The next material to focus on is the blue glass double door. A- In the scene, select the object under the name of “Windows ”. B- Select a new empty material slot. C- Since this material is also glass, we are going to copy the previously created glass shader, and paste it into this new material slot. Select the previously created glass material slot. 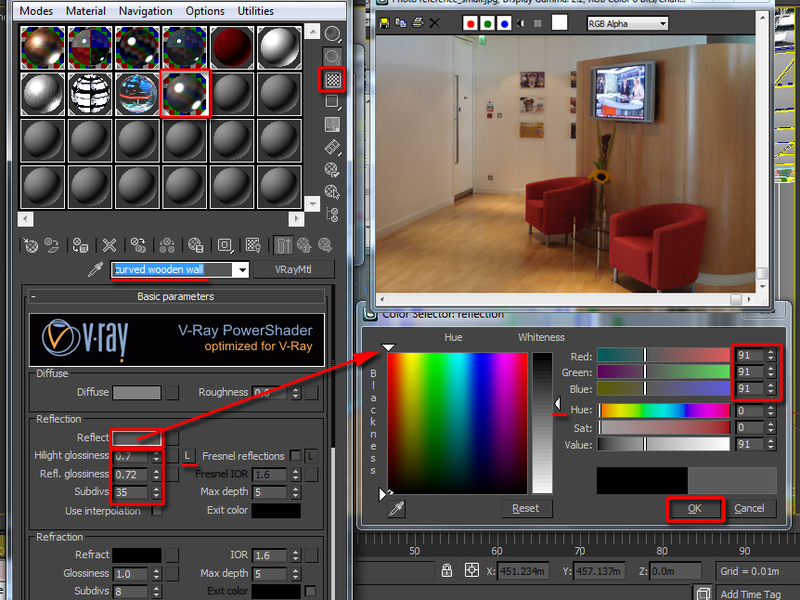 D- Right click on the “vraymatl” shader toggle, and choose to “copy” on the pop up list. 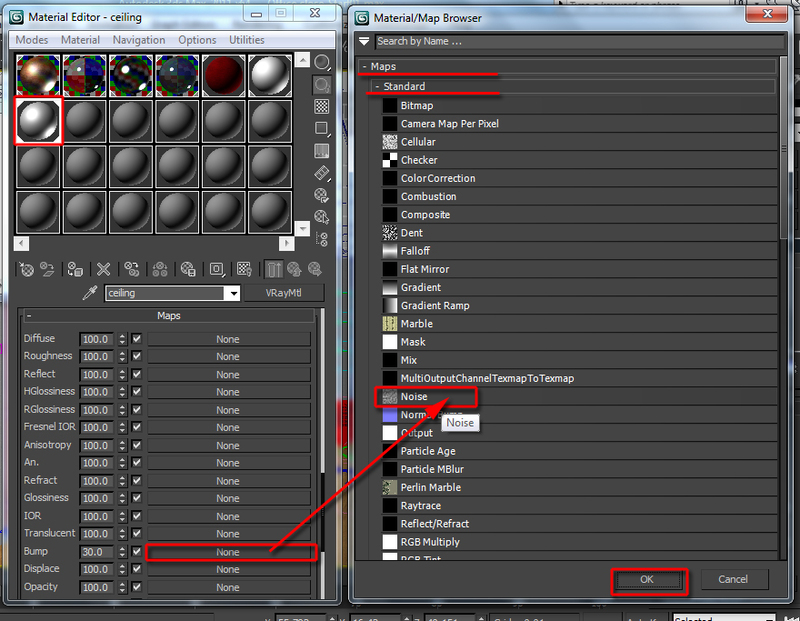 E- Select the new material slot, right click on its “vraymatl” shader toggle and choose to “paste (copy)” its components. Also, name this material “blue glass”. 30. Assign this material onto the selected object. The next step is to change this material to blue, make it less transparent and less reflective. A- Change the “diffuse” colour swatch to blue(R=60; G=85; B=96). B- To make the glass less reflective simply reduce its “reflect” colour swatch to a darker grey(R=40; G=40; B=40). 31. The next material to work on is the chair. For this material we will try to emulate a real “fabric like” material on a chair. One of the most recognizable characteristics of a fabric material on a chair is the “falloff” effect that occurs on edges of the surface, especially when affected by a light. This effect is also noticeable with skin textures, hair, etc. 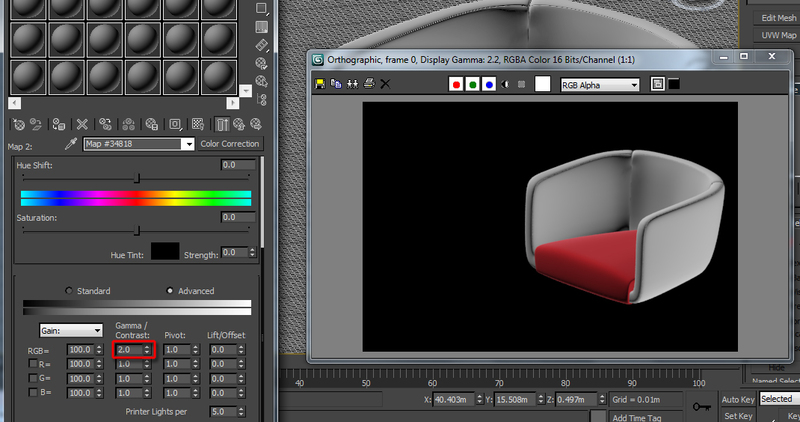 A- In the scene, select the object under the name of “seat”. B- Create a new v-ray material slot as previously done. C- Open its “diffuse” toggle and choose the “falloff” procedural map, from “maps”/”standard” rollout list. The “falloff” parameters should load up. 32. The falloff material usually consists of two different colors: top color=dark and bottom color=bright. As we are using a real fabric texture as opposed to colors, we need to emulate the same effect. 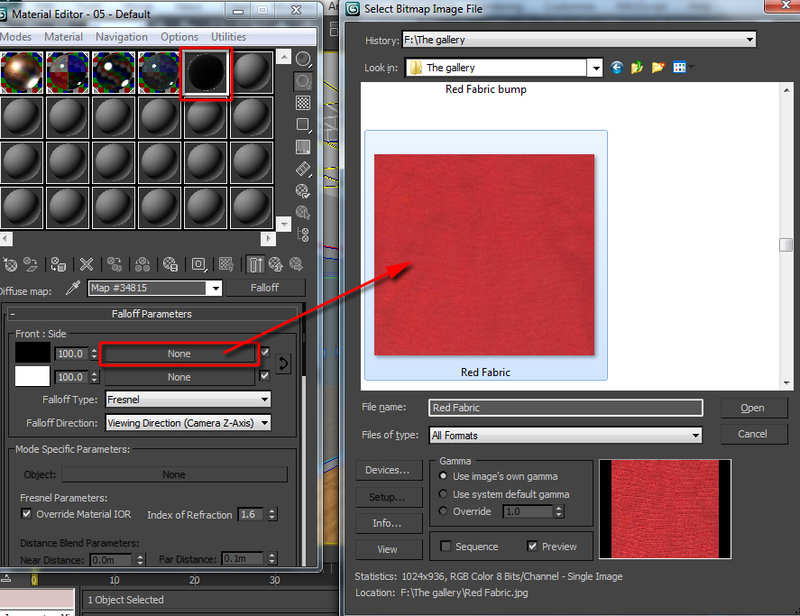 A- Click open the top (dark) toggle and choose the texture under the name of “red fabric”. B- Once loaded, to darken its color apply the “color correction” procedural map as previously done. 33. Back in the “falloff” parameters, copy and paste (i.e. drag and drop) the top toggle component onto the bottom one. The “copy (instance) map” dialog should be prompted. Choose the “copy” method. Next, go inside the bottom toggle and increase its “gamma/contrast” value to about 2.0. 34. The “falloff” effect is apparent now. However, the texture is not. For organic and irregular shapes professionals often use the “mapscaler” modifier to help wrap the texture realistically around the surface. 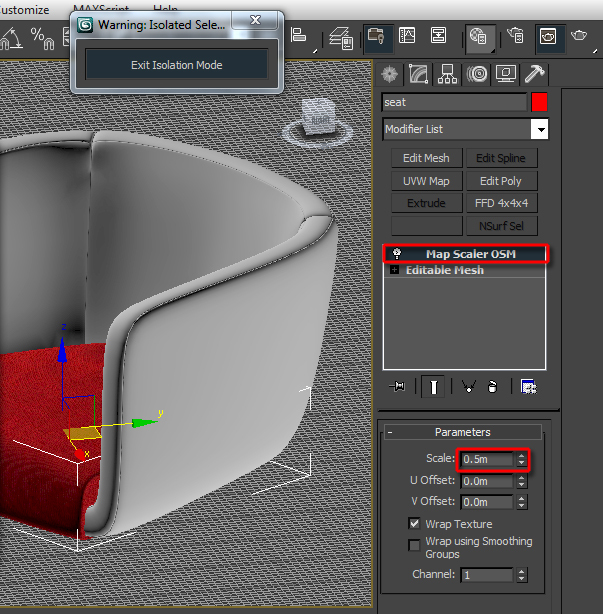 A- While the “seat” object is still selected, pick the “mapscaler” modifier from the modify list. B- The texture seems a bit stretched; tile it by increasing its “scale” value to about. 0.5m. Note how the texture now fits nicely without seams as such. C- Test render the results and assign this texture to other relevant parts of the chair using the techniques highlighted earlier. 35. The next material to work on is the wall. Typically, plaster walls have some shine to them and some texture, without visible reflections. A- To emulate this effect, first create a new v-ray material slot as previously done. Name it “wall”. B- In “reflection” group, brighten up its current color to a lighter grey color(R=42; G=42; B=42) to add some shine. C- Enable the “highlight glossiness” and increase its value to about 0.48. Note the material thumbnail changing as the values are tweaked. D- Also, increase the “refl. Glossiness” to about 0.65; and the “subdivs” to 35. E- Since we don’t want any reflections on the wall we are going to disable the reflections and refractions. Scroll down to the “options” parameters rollout and disable the “trace reflections” function and the “trace refractions”. What we did was to retain the glossiness of the surface without having to render time consuming reflections. 36. The next step is to add a plaster texture to the wall surface. A- Locate and apply a texture under the name of “PlasterWhite_tiled”. B- Next, apply a standard “uvw map” modifier and choose the “box” mapping type. C- “Fit” the texture by clicking on the relevant button in the “alignment” group. D- In the map “coordinates” rollout, enable the “show standard map in viewport” button. 37. While the texture and its color are looking OK the wall surface still looks slightly dark. A- Add the “color correction” procedural map on top of this texture. B- Once loaded, scroll down to the “lightness” rollout and enable the “advanced” function. C- Increase the “gamma/contrast” value to about 10.0, and test render the changes. It’s worth mentioning that further tweaks may be needed once the lights are added. 38. The next material to tackle is the ceiling. 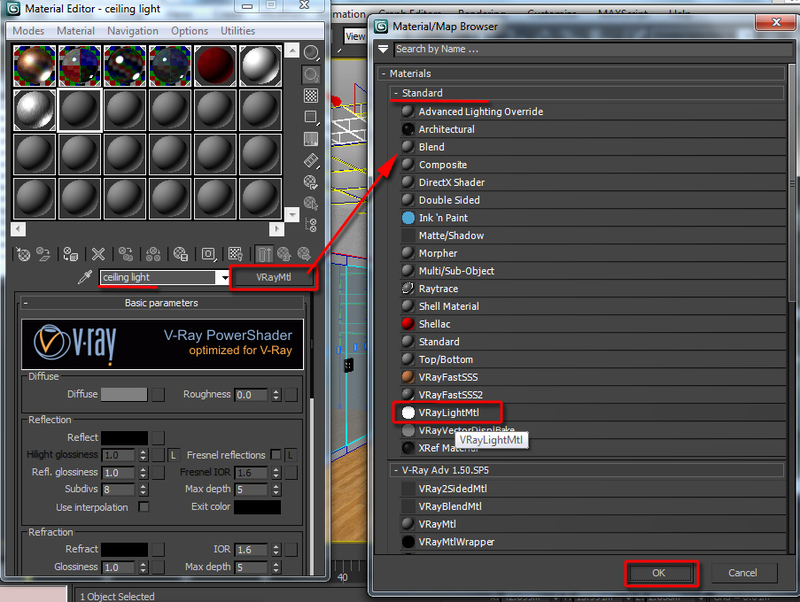 A- Create a new v-ray material slot and name it” ceiling”. 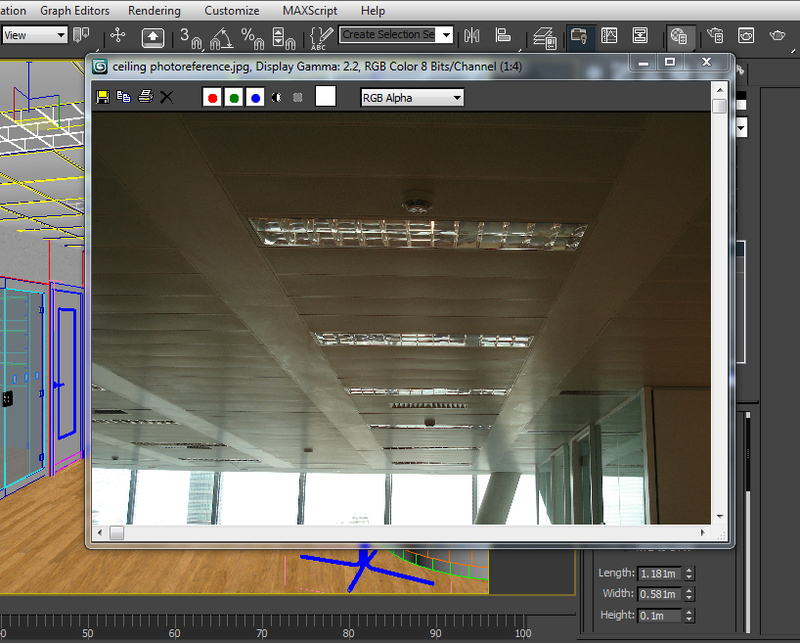 B- In the scene, select the object under the name of” Layer:--ceiling tiles” and assign this new material to it. C- As ceiling panels are often white, we are going to change its “diffuse” color swatch to white(R=255; G=255; B=255). D- Since the client wanted the ceiling to be slightly reflective, we are going to change its “reflect” color swatch to light grey(R=60; G=60; B=60). E- To add a slight shine to it, decrease its “highlight glossiness” value to about 0.54; and the “refl.glossiness” value to 0.85. Also, increase its “subdivis” value to 35. Test render to see the changes. 39. The ceiling render is looking OK. However, it looks flat. Most ceiling panels have slight irregular undulations throughout. To emulate this realistic occurrence, we are going to apply a “noise” procedural map to it. A- Scroll down to the bump toggle and apply the “noise” procedural map from the “material/map browser” dialog. Once loaded, test render the results. 40. The ceiling undulations look OK. However, it could look better if the tiling was increased. A- In the “bump map:” coordinates”, increase the “X tiling” to 5.0. B- Go back to the ceiling’s main parameter and decrease the bump value to about 15. These values will be tweaked further once lights are added. 41. The next material to concentrate on is the ceiling light. Prior to begin working on this material, bring into max the photo reference image under the name of “ceiling photoreference”. 42. Since this material is supposedly lit, we are going to start by creating a new v-ray material and applying the “vraylightmtl” to it. Its parameters should load up. In the scene, select the light ceiling object under the name of “Plane50”, and assign this new material to it. 43. Next, we are going to apply the texture under the name of “ceiling grill light” to it. Locate and apply the texture to its “color” toggle. As mentioned earlier, all textures applied should originate from a real photo taken of the entire surface in question. 44. The texture doesn’t seem to be visible still. A- Enable the “emit light on back side” function. This function allows the back face of an object to be lit. B- Also, apply the “uvw map” modifier; set the “mapping” type to “box” and set it to “fit”. 45. The ceiling light object is looking much better now. Assign this material to all ceiling objects in the scene. Test render the results. 46. At the moment all ceiling light objects look evenly lit. In real life this scenario rarely happens. To uneven the ceiling light brightness we are going to tweak with its output “color map” curves. A- First, sharpen the texture by decreasing its “blur” value to about 0.01. B- Scroll down to the “output” rollout and turn on the “enable color map” function. Its graph should open. C- In the “color map” group, the “mono” function should be enabled by default. 47. Next, click on the “move” button and begin moving the points. It is common practice to begin moving up the upper most point of the graph; followed by tweaking the others. The final result should be a smooth curve extending all the way up. This should yield highlights in the material editor thumbnail. You may try different values if desired. Test render the results. 48. For this material, we are going to use an approach most reputable companies use: Which is to apply a real photograph of a TV screen switched on, onto the relevant 3d object. This methodology will ensure that all physical properties of a real TV screen are captured in full. Furthermore, use the “vraylightmtl” procedural map as previously done. Next, locate and apply the texture under the name of “tv screen1main”. Looking closely at the photo reference, one can assess that the curved wooden wall is smooth, slightly reflective and with a strong shine. 49. For this last material, we are going to use a similar approach to the one used to create the wooden floor material. A- Create a new v-ray material slot and name it “curved wooden wall”. B- In the scene, select the object under the name of “curved wooden wall” and assign this new material to it. C- To emulate the shine/reflectivity similar to the photo reference, we are going to change the “reflect” color swatch to light grey(R=91; G=91; B=91). 50. The next step is to match this material’s physical properties close to the photo reference. 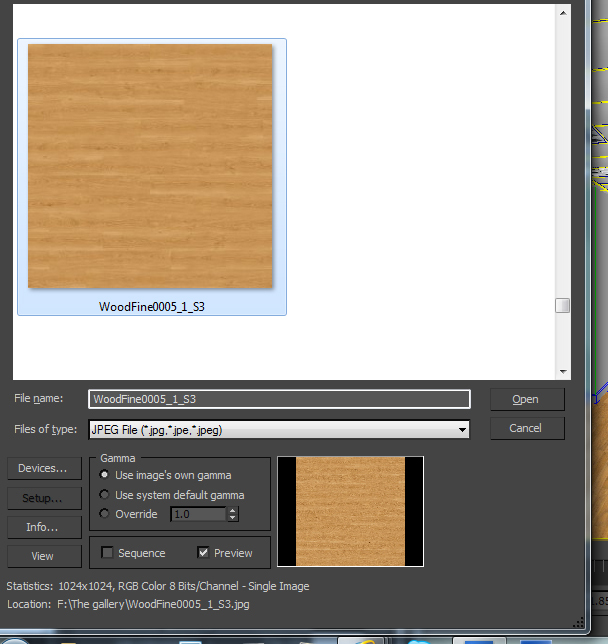 A- Locate and apply the texture under the name of “WoodFine0005_1_S3”. Its parameters should load up. B- Set the “blur” value to 0.01. C- In the viewport, this texture alignment doesn’t look correct. Change its “w” rotation to 90.0, and its tiling values to u=0.5 and v=0.5. 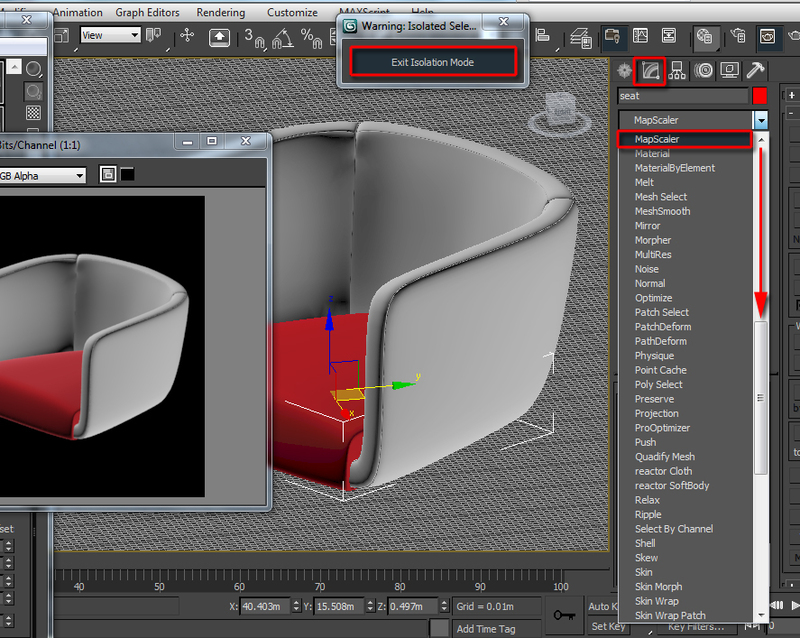 D- Apply the “map scaler” modifier to the respective object in order to make the texture wrap correctly around the curved surface. Also, change the “scale” value to about 2.622 to make the tiling more realistic; and “v offset” it to about -0.001m. 51. Test render the results. To match this wood finish closer to the photo reference, we are going to apply the “color correction” procedural map on top of the original texture. Increase its “saturation” to about 5.648. In the “lightness” rollout, enable the “advanced” function and reduce its “gamma/contrast to 0.7. The remaining materials were created using the same techniques highlighted earlier. Conclusion: It is imperative to create materials and shaders using real photos as references. Due to the fact that the global illumination (GI) and lights take a considerable amount of time to compute, the initial task of applying shaders and textures should be carried in a “bare” scene, in order to speed up the process. By using this faster approach at start, the user will be left with minor tweaks and adjustments to address when the global illumination and the lights are created at a later stage. Please check my latest manual book entitled “3d realism practical and easy workflows” to see the entire in-depth process of pre-production, production and post-production.